Perfect for use in your short barrel rifle or AR pistol, this Hornady TAP Urban Tactical ammunition is a great choice when collateral risk is high. Each round is loaded with a 55 grain Urban Tactical projectile with a polymer tip. This unique design delivers rapid expansion with massive fragmentation to create a dramatic wound cavity. Ideal for use in urban settings these rounds are also engineered to prevent dangerous over penetration or ricochet in most non-barrier defense situations. This high velocity ammunition leaves the muzzle at 3229 feet per second with a muzzle energy of 1273 foot pounds. Factory fresh, this ammunition features high-quality brass casings, non-corrosive boxer primers, and clean burning powders. Hornady has a reputation producing high-quality, innovative ammunition. 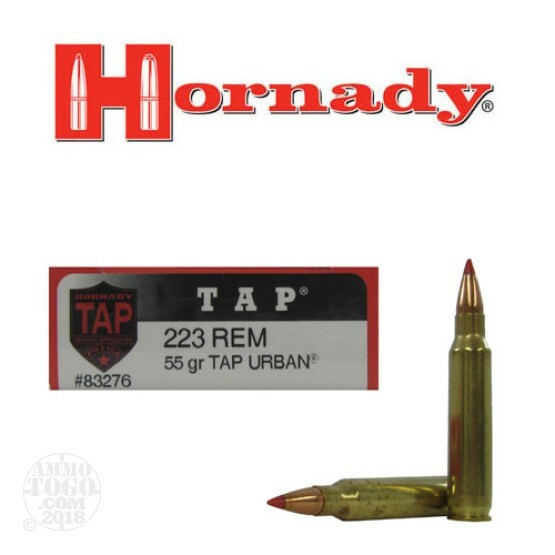 This Hornady TAP ammo is perfect for law enforcement. Designed specifically for tactical teams, snipers, and LEOs, these loads deliver the reliable performance and pin-point accuracy that have made the Hornady name famous. Like its counterpart 308, clean and accurate. The absolute best in my opinion. Shoots lights out regardless of make, model or twist. It may cost a little more but well worth it given its consistency and broad based application. Can't go wrong with this ammo. This ammo groups very tight in my ar-15a2 dissipator, 16in bbl, 1x9twist .75in at 100m, 62degrees outside no wind present.